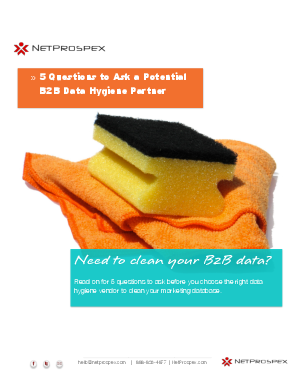 Many B2B marketers and operations teams are turning to third-party vendors to handle the cleanse and hygiene process of their marketing databases as they look for ways to get the most out of their marketing programs. As nearly 50M people change jobs annually, the impacts of bad data are hitting home. If data quality is a problem you, like many marketers, want to fix, you’ve got to do your research when looking to invest in a data hygiene partner. Making the right decision about whom you’ll partner with for cleanups and ongoing maintenance is of paramount importance. To make sure you know the right questions to ask potential vendors, we put together this quick guide to help you during your selection process.